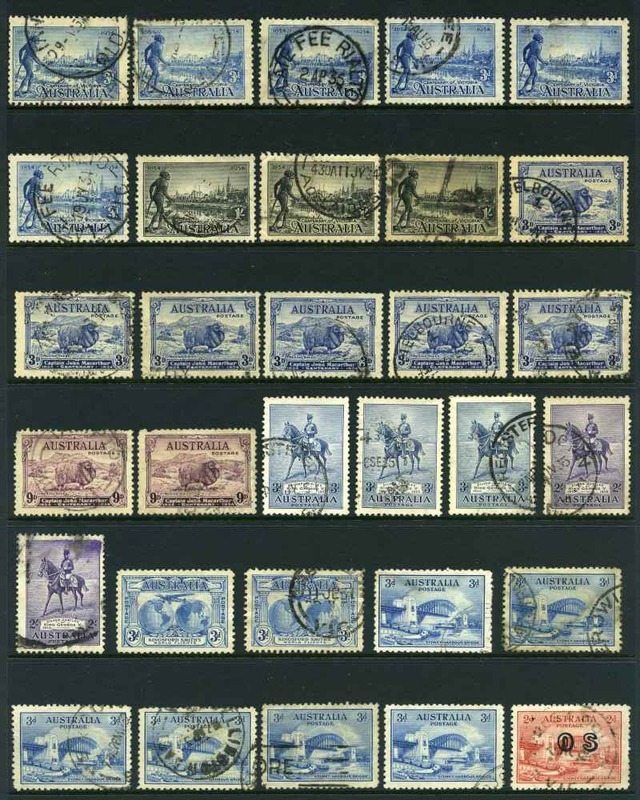 Collection of MUH, MLH and used Kangaroo, KGV and Pre-Decimal stamps from 1913 to 1965 in Seven Seas Hingeless album. 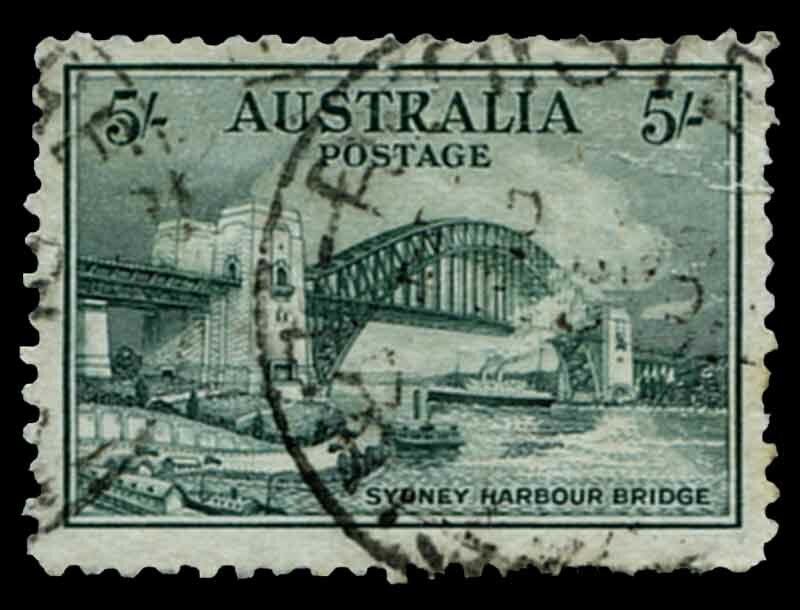 Noted 1917 10/- 3rd Wmk Kangaroo Perf OS CTO, 1914 6d Claret Kookaburra MLH, 1931 2d and 3d Kingsford Smith O/P OS CTO, 1932 1/- Lyrebird O/P OS MLH, 1932 5/- Sydney Harbour Bridge commercially FU and centered to left, 1934 1/- perf 10½ Victorian Centenary MLH, 1934 9d Macarthur MUH, 1935 1/- Anzac MUH, 1935 2/- Silver Jubilee mint without gum, 1946 5/- BCOF MLH, 1949-50 Arms set MLH and 1963-64 Navigator set MUH. Odd minor fault. 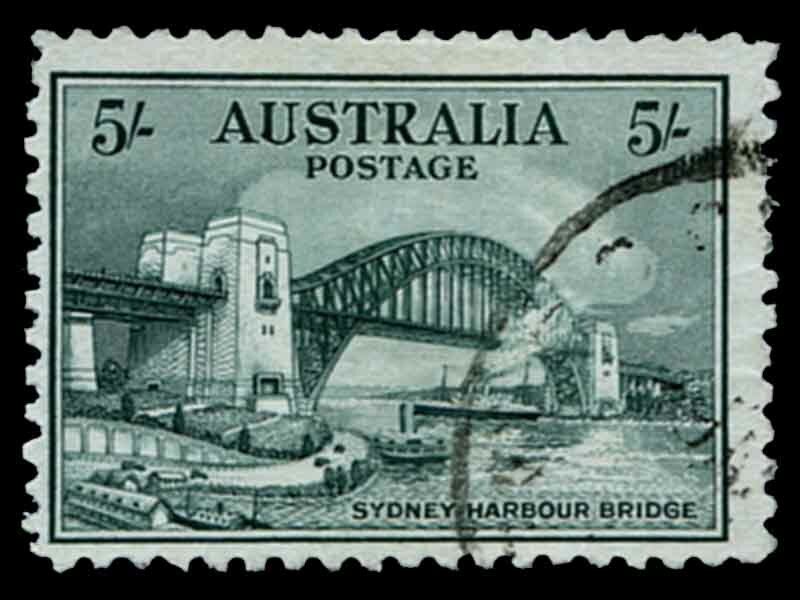 Collection of 295 different MUH Pre-Decimal issues from 1914 to 1965, including 1914 6d Claret Kookaburra, 1931 6d Brown Airmail, 1932 1/- Lyrebird, 1932 5/- Sydney Harbour Bridge (MLH), 1934 Perf 10½ and 11½ Victorian Centenary sets, 1934 Macarthur set, 1934 1/6 No Wmk Hermes, 1935 Anzac set, 1935 Silver Jubilee set, 1936 SA Centenary set, 1937 NSW Sesquicentenary set, 1937-40 3d Blue Die I White Wattles, Die I, Die IA, Die II Thick and Thin Paper and Die III KGVI, 1938-49 Thick and Thin Paper Robe sets, 1949-50 Arms set, 1964 5/- White Paper Cattle and 1963-64 Navigators set of 8. Generally fine condition with odd minor fault and varied centering. High retail value. Accumulation of 300 fine used 75¢ to $1.00 commemorative stamps from 1980's to 1990's. Good range with varying duplication. Some CTO with GPO Melbourne cancel. 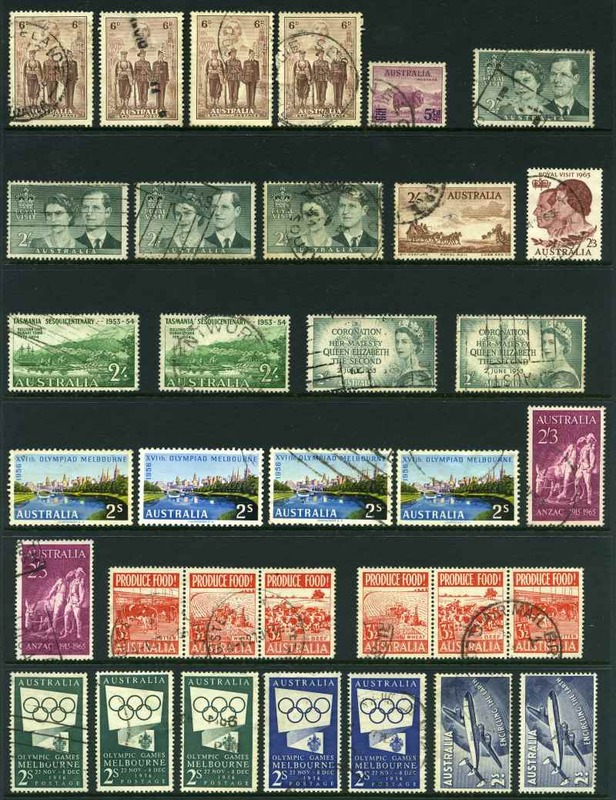 Collection of 50 MUH Decimal issues from 1966 to 1976 in singles, pairs, strips and blocks with major listed varieties and 4 Plate No blocks of 4. ACSC catalogue value $801.00. 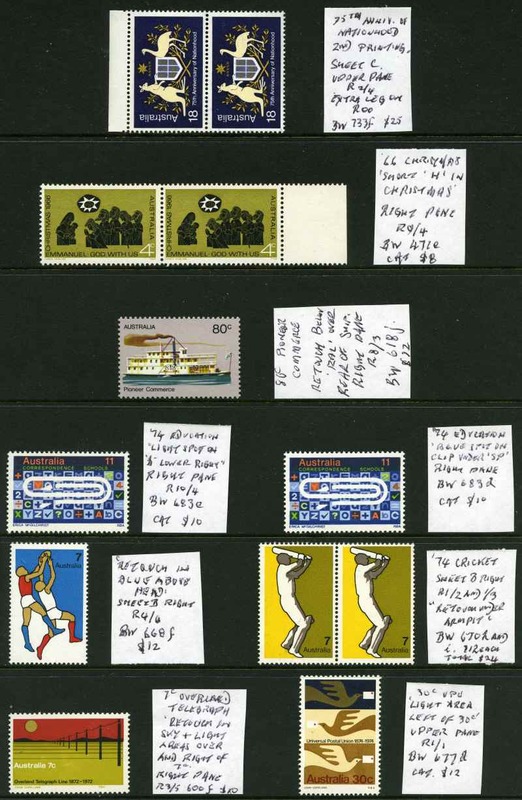 Accumulation of thousands of good to fine used higher value commemorative stamps from 1980 to 2005 including range of International issues. Huge range of issues with varying duplication. Collection of mint and used Kangaroo, KGV, Pre-Decimal and Decimal issues from 1913 to 1989, plus a range of Australian States and Australian Antarctic Territory issues in 4 loose leaf albums. Includes handy range of early issues and some duplication. Face value of mint Decimal issues $1,302.00. Also Decimal off paper mixture in shoebox. 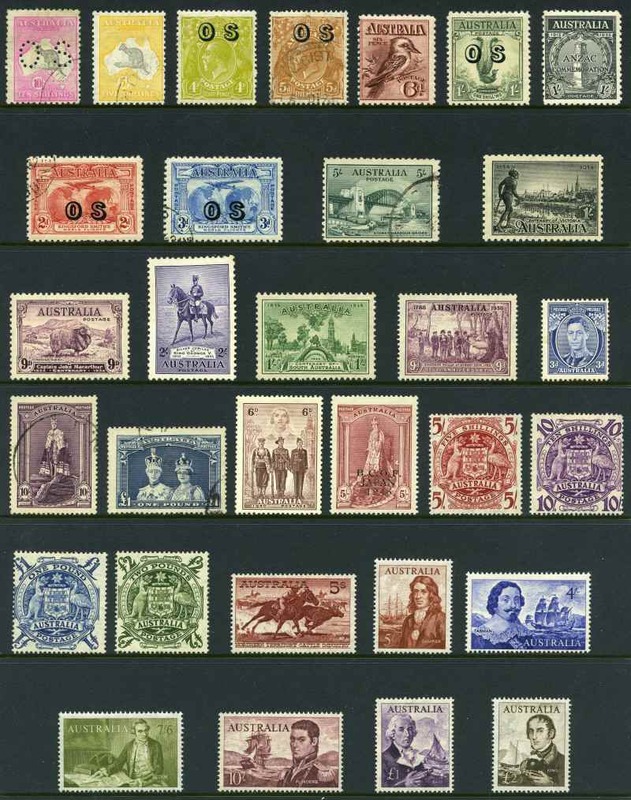 Collection of mostly used Kangaroo, KGV, Pre-Decimal and Decimal issues from 1913 to 2012, including handy range of early items, Australian States, Perfins, Koala and Kangaroo reprints and Australian Territory issues on Hagner sheets in 10 binders and 5 stockbooks. Noted 1963-64 Navigator set FU, 1971 Christmas Cream Paper block of 25 MUH and numerous higher value Decimal commemorative issues. Usual variable condition and duplication. 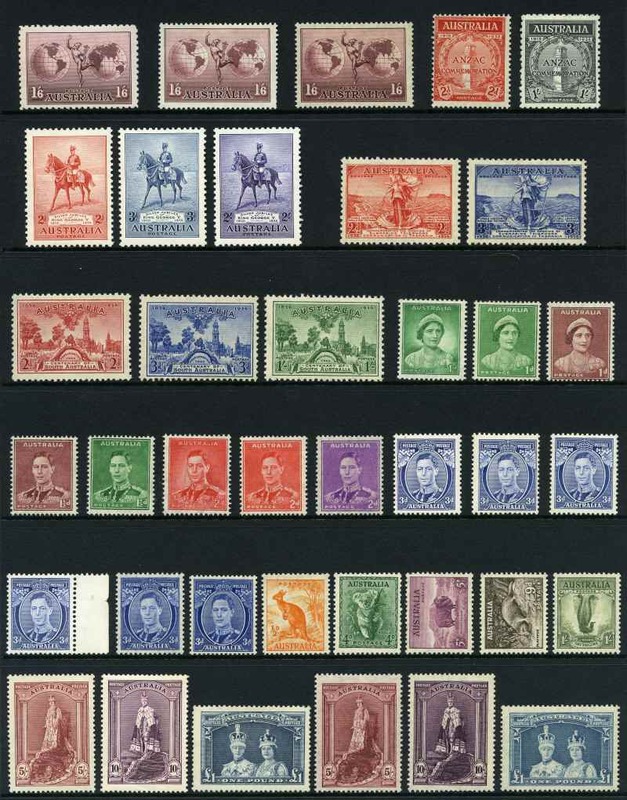 Selection of 159 used Pre-Decimal stamps from 1913 to 1965 including handy items and a small range of Kangaroo and KGV issues with varying duplication. Noted 1929 5/- Small Mult Wmk Kangaroo perf OS, 1932 6d C of A Wmk Kangaroo O/P OS (3), 1915 4d Orange Single Wmk KGV with Line through "Four Pence" variety, 1914 6d Claret Kookaburra, 1934 1/- Victorian Centenary (3), 1935 1/- Anzac (4), 1935 2/- Silver Jubilee (2) and 1938 10/- and £1 Thick Paper Robes (2 of each). Usual variable condition. Collection of mint and used Pre-Decimal and Decimal issues from 1914 to 1994 in 2 Seven Seas albums with slipcases. Noted 1914 6d Claret Kookaburra MLH, 1928 3d Blue Kookaburra M/S MLH (trimmed top margin), 1971 Christmas block of 25 MUH and other handy items. Early issues in usual variable condition. Face value of MUH Decimal issues from 1974 onwards $484.00. Also large range of mint and cancelled FDI PSE's and some souvenir covers in shoebox. 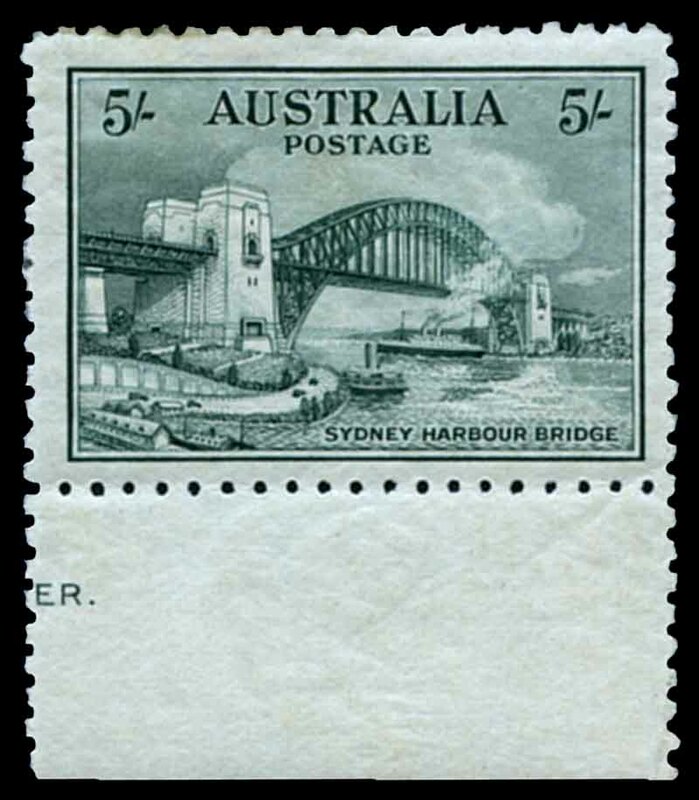 Collection of mint Pre-Decimal and Decimal issues, mainly in blocks of 4 from 1927 to 1970 including 1928 3d Kooka M/S MLH (small crease), 1934 9d Macarthur imprint pair MLH, 1935 1/- Anzac pair MUH/MLH, 1935 2/- Silver Jubilee MUH (2), 1940 AIF set in imprint blocks of 4 MLH/MUH and 1964 5/- White Paper Cattle block of 4 MLH/MUH. Odd minor fault. Also used collection from 1914 to 1972 including 1914 6d Claret Kooka CTO and Australian Territories and Papua New Guinea collection MLH, plus small range of Foreign stamps in 2 loose leaf binders. 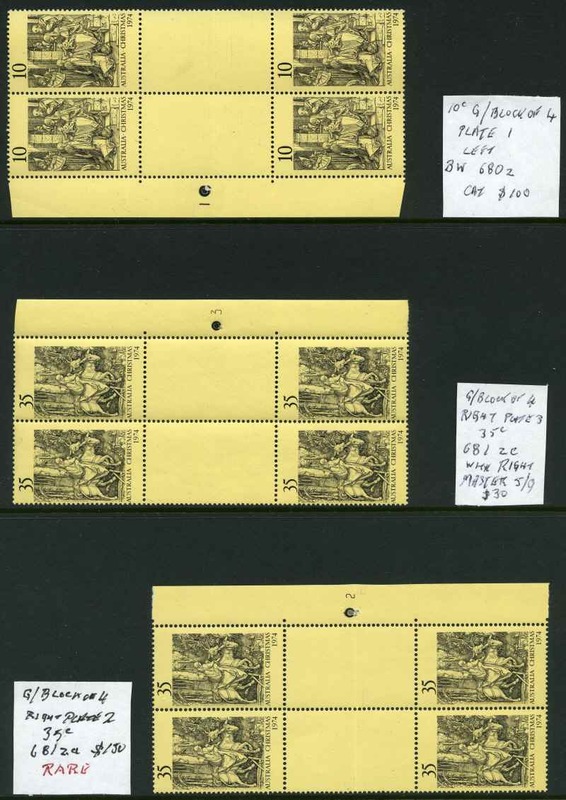 Selection of 1,435 mostly low value Pre-Decimal stamps MUH, with many different. 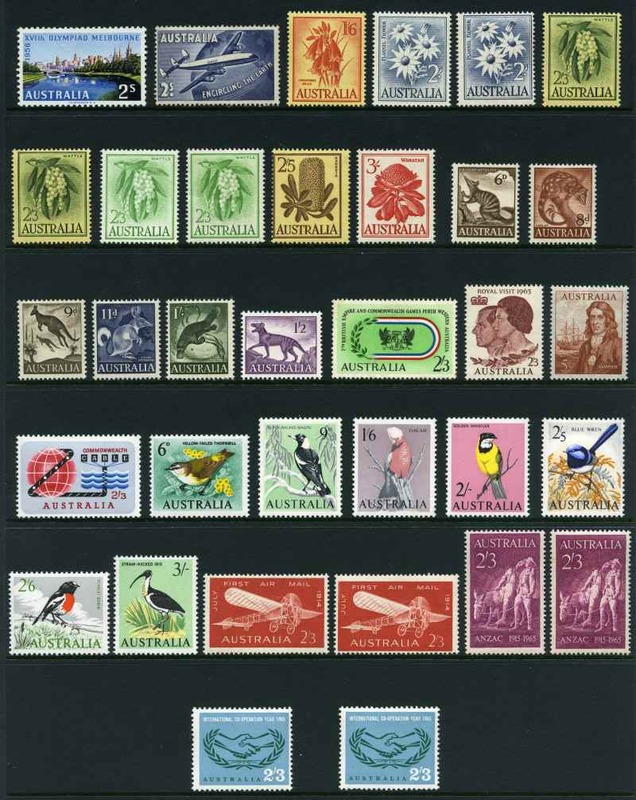 Selection of 1,550 different used stamps, with numerous sets including a few States, Australian Antarctic Territory, Christmas Island Australia and Cocos (Keeling) Islands Australia issues. 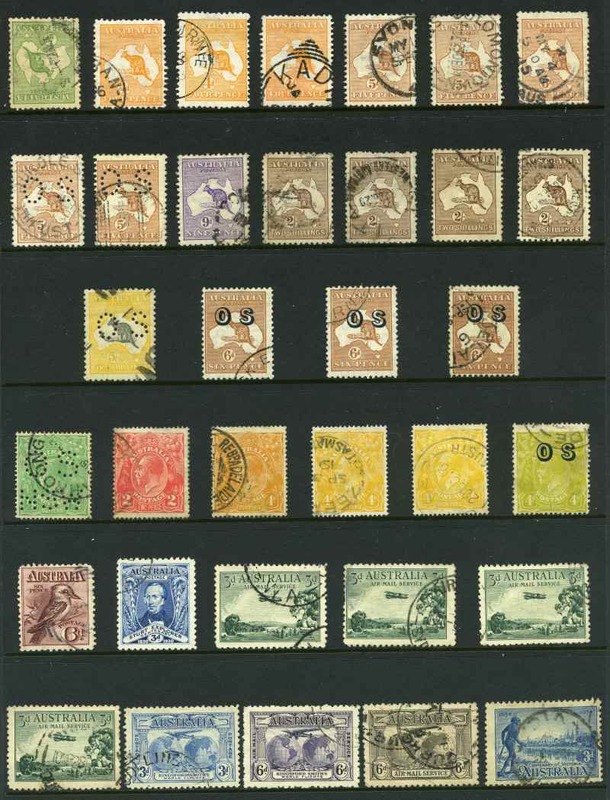 Selection of 128 MUH and MLH Kangaroo, KGV and Pre-Decimal issues from 1913 to 1965 including 2d, 4d, 5d, 2/- (No gum) 1st Wmk, 2½d (3), 3d ,6d (2, one perf OS) 3rd Wmk and 1/- Small Mult Wmk Kangaroo's MLH, 4d Orange, 4d Violet, 4d Blue, 4d Olive, 4½d, 5d Single Wmk and 1/4 Small Mult Wmk perf 13½ KGV MLH, 1934 Perf 10½ Victorian Centenary set MLH, 1938 Thick Paper Robe set MLH and 1949-50 Arms set MUH. Few faults, but mainly fine. High retail value. 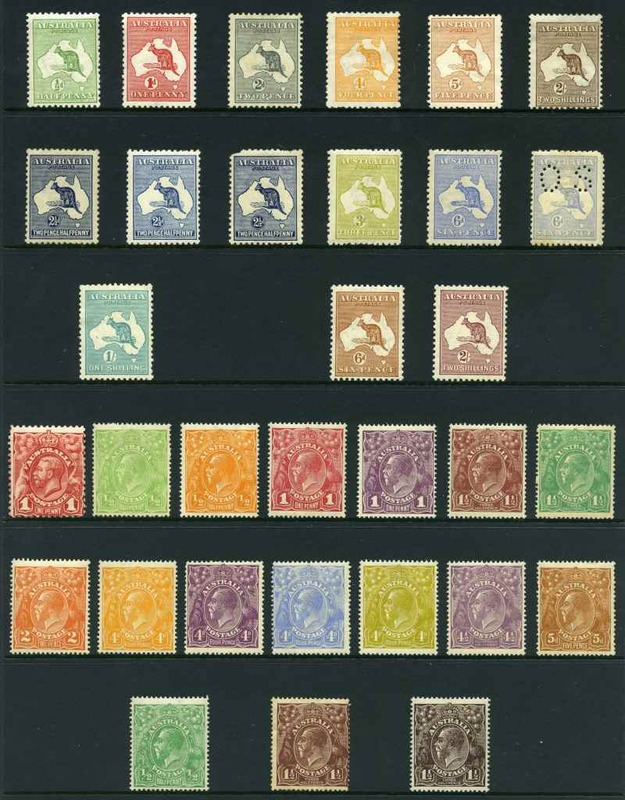 Collection of mint and used Kangaroo, KGV, Pre-Decimal and early Decimal stamps from 1913 to 1968 on album pages, including 1913 1st Wmk Kangaroo set to 2/- perf large OS GU and 5/- CTO with Bottom frame damaged under "E S" variety (excludes 3d), KGV issues to 1/4 value inc C of A Wmk set O/P OS CTO, 1914 6d Claret Kookaburra MLH, 1927 1½d Canberra, 1928 3d Kookaburra, 1929 3d Airmail Type A, 1929 1½d WA Centenary and 1930 Sturt set perforated OS CTO, 1928 3d Kookaburra M/S mint (thins), 1931 2d and 3d Kingsford Smith O/P OS CTO, 1932 5/- Sydney Harbour Bridge MLH part imprint copy with tiny thin, 1934 1/- perf 11½ Vic Centenary, 1934 9d Macarthur, 1935 1/- Anzac, 1935 2/- Silver Jubilee, 1938 Thick Paper Robe set, 1950 £2 Arms and 1963-64 Navigator set all MLH. Usual variable condition and some heavy hinging. 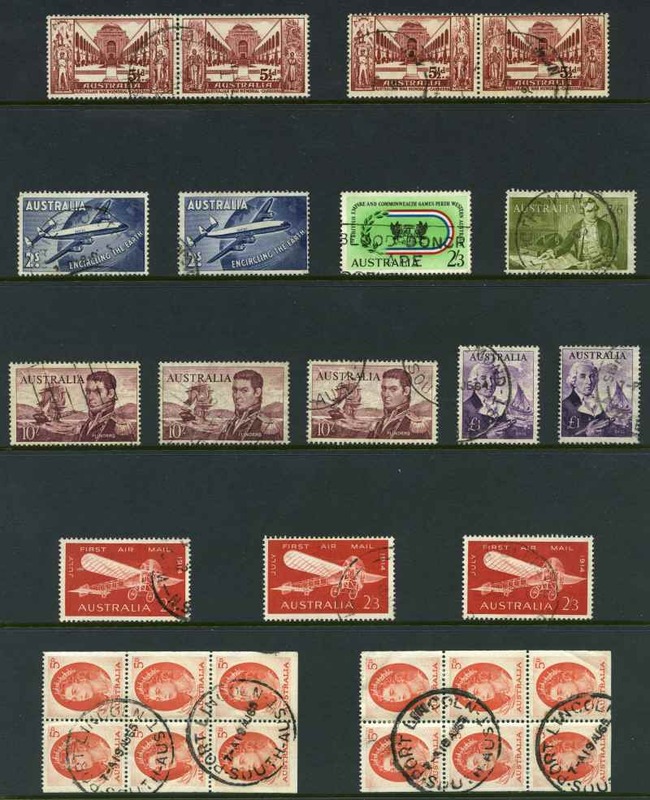 Collection of MUH and used Pre-Decimal stamps from 1914 to 1965 in Seven Seas Hingeless album. Noted 1932 5/- Sydney Harbour Bridge commercially used with minor faults and 1963-64 Navigator set MUH. Odd early issue with minor fault. 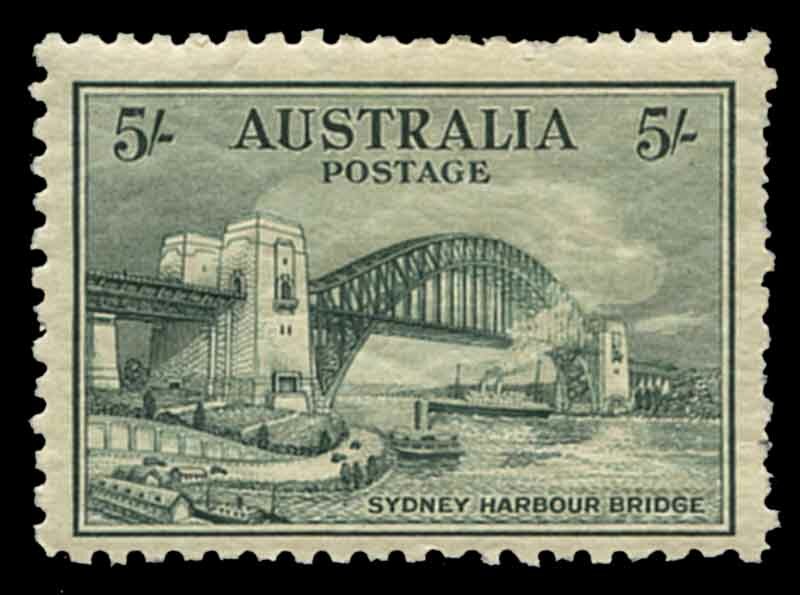 Selection of 212 mint Pre-Decimal issues from 1914 to 1965, including 1914 6d Claret Kookaburra, 1932 5/- Sydney Harbour Bridge (short perfs), 1934 9d Macarthur (2), 1934 1/6 No Wmk Hermes, 1935 2/- Silver Jubilee (2) and other handy issues in Lighthouse stockbook. Some faults and varying duplication. 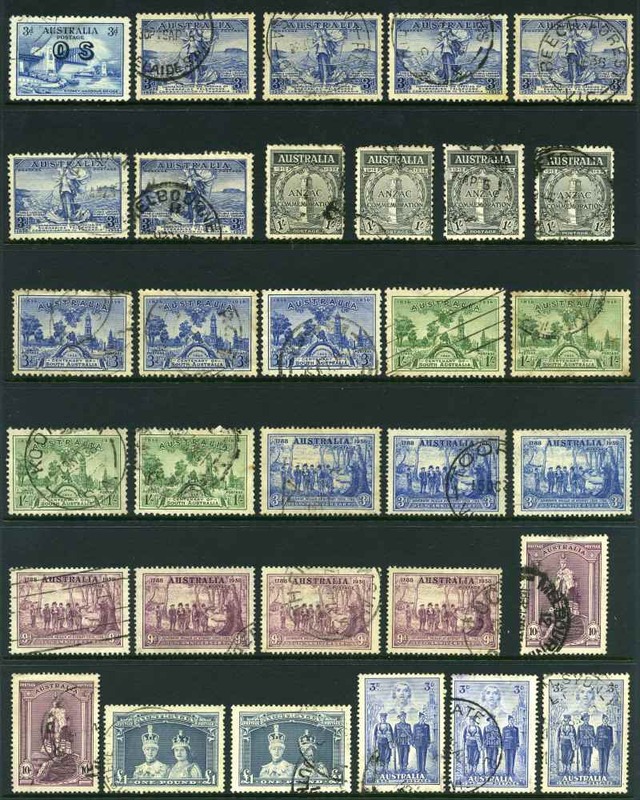 Accumulation of 6,166 MUH low value Pre-Decimal issues from 1927 to 1965, mainly in sheets, including a range of better items and some varieties. Noted 1927 1½d Canberra sheet of 80, 1945 5½d Surcharge half sheet of 80, 1946 Peace set in sheets of 60, 1946 Mitchell set in sheets of 60, 1953 3½d Food sheet of 100, 1953 Coronation set in sheets of 80 and 1964-65 6d, 1/6, 2/- and 2/6 Birds in sheets of 60. Mainly fine condition with some faults. 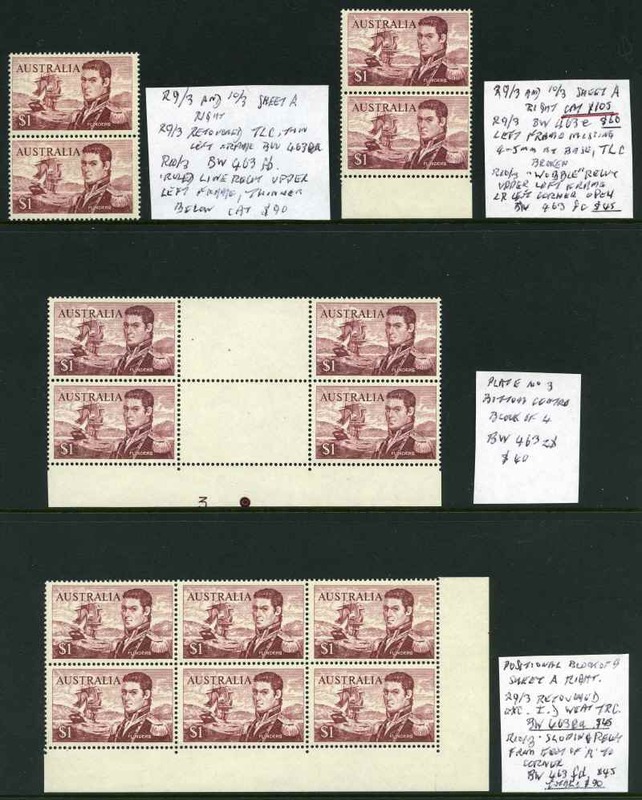 Accumulation of 1,240 MUH low value Pre-Decimal issues from 1927 to 1965 in singles, pairs and blocks, including a range of better items. Noted 1949 1/6 Wmk Hermes (40), 1951 1/6 Federation (46) and 1953 Food strips of 3 set (6) and blocks of 9 set (2). Also range of early low value Decimal issues MUH including 1971 Christmas White Paper block of 25, plus a few covers. Odd minor blemish. 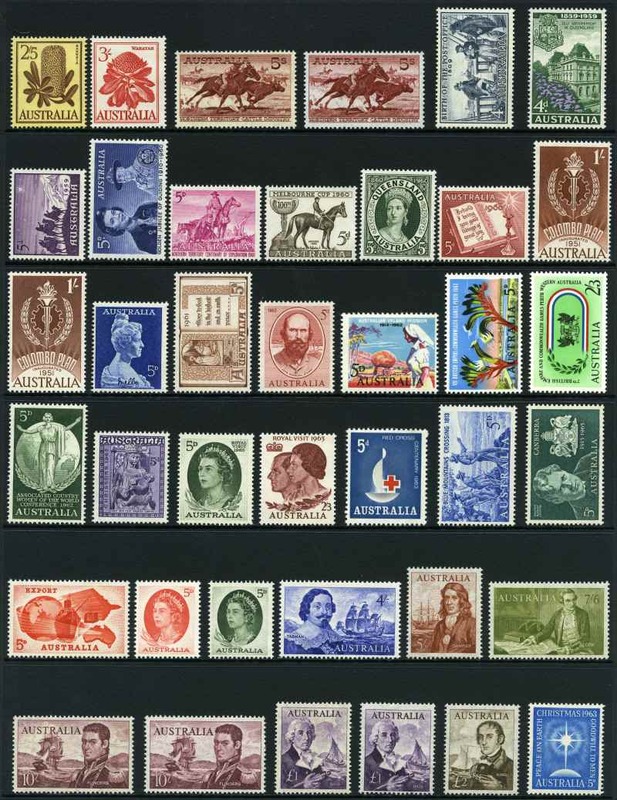 Collection of over 2,000 different used Decimal stamps from 1966 to 2013, including numerous sets and higher values, plus small range of Pre-Decimal issues in large Chinese stockbook. 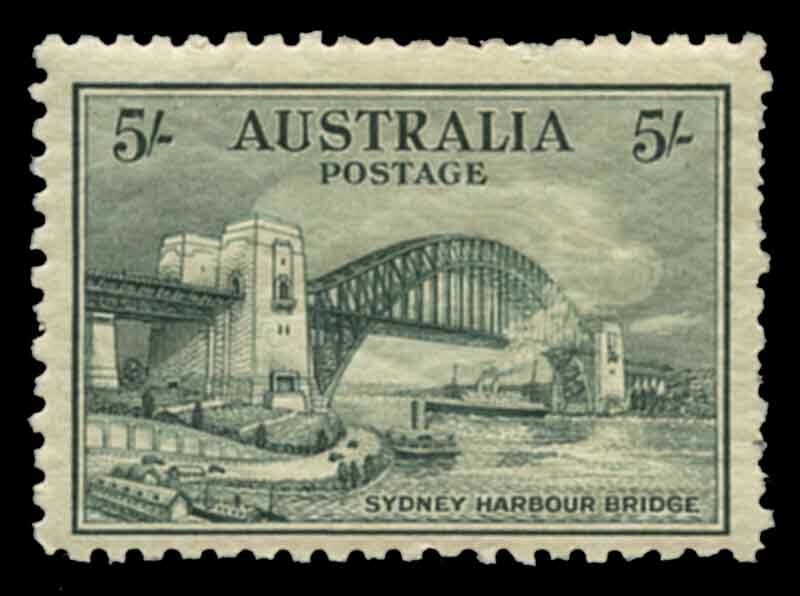 Accumulation of 46,400 Decimal commemorative FU stamps in bundles of 100, from 1970 to 2005, with main strength from the 1990's onwards, including 1996 AFL Centenary (100) and 1998 Australian Olympic Legends (600) peel and stick sets. 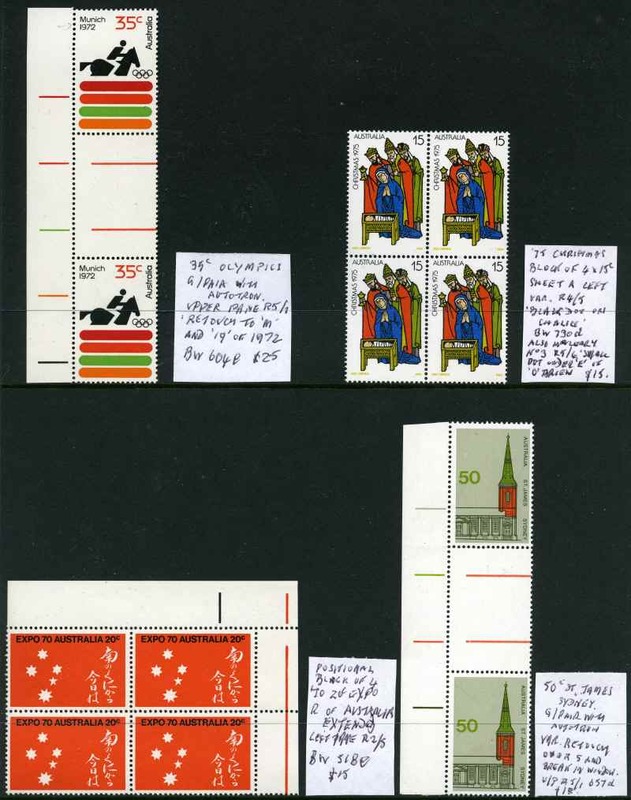 Accumulation of many thousands of used Decimal stamps from 1966 to 2012, including numerous sets and higher value commemorative issues in large Posthorn and Lighthouse stockbooks, Hagner album, a few FDC's folder and off paper mixture in box. Some Australian Territory and Papua New Guinea content, plus Seven Seas 2013 compact catalogue. Varying duplication. Selection of 3,400 used stamps, made up into packets of 1,000, 1,100 and 1,300 different with numerous sets including a few States and Australian Antarctic Territory. Also a selection of FDC's and Postal Stationery items. Accumulation of 400 used Decimal higher value commemorative stamps to $1.00 from 1960's to 2000's. Good range with some duplication. Mainly fine used including some CTO with GPO Melbourne cancel. 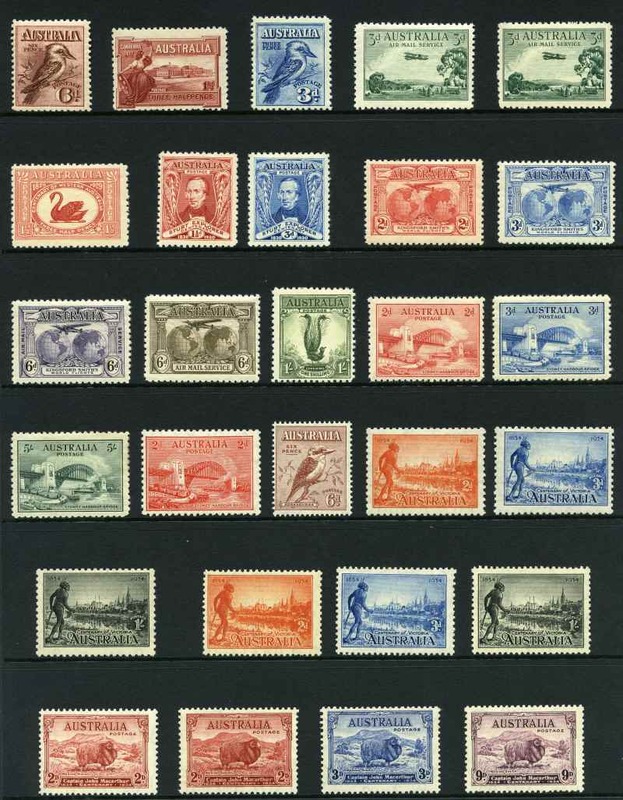 Selection of 1,725 different used stamps, with sets and higher values including a few States, Australian Antarctic Territory, Christmas Island Australia and Cocos (Keeling) Islands Australia issues. 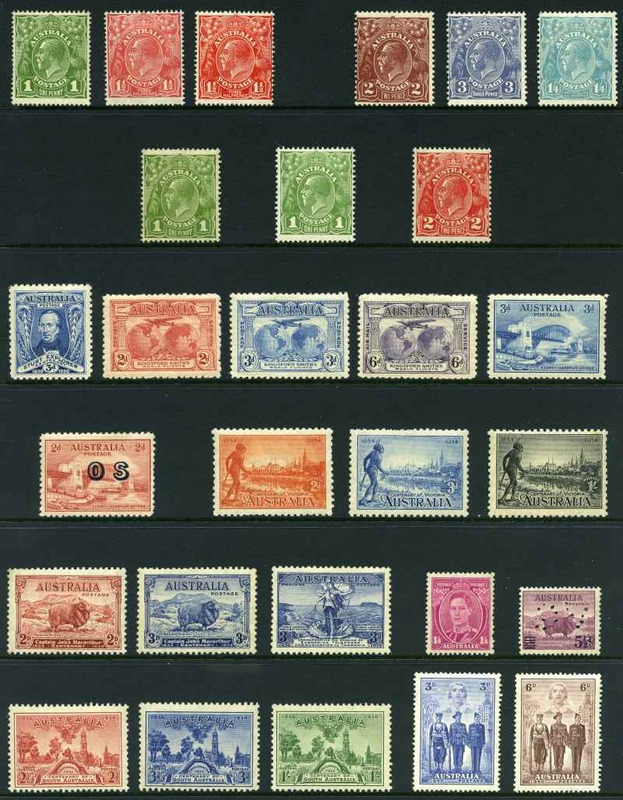 Collection hundreds of mostly MUH Pre-Decimal from 1914 to 1965 including 1914 6d Claret Kookaburra MLH (2), 1929 1½d WA Centenary imprint block of 6 with Re-entry to swan's neck and "T" of "Australia" variety (ACSC 138e), 1931 6d Kingsford Smith imprint block of 8 with Re-entry to "T" of "Australia" etc variety, 1934 1/6 No Wmk Hermes, 1935 Silver Jubilee set (7), 1936 SA Centenary set (4), 1937 NSW Sesquicentenary set (5), 1940 AIF set (6), 1963-64 Navigator set and many other useful items. Some minor faults. 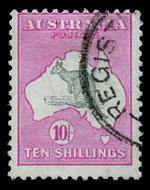 Also accumulation of over 1,500 MUH low value Pre-Decimal issues from 1938 to 1965 and small range of used Kangaroo and KGV issues. 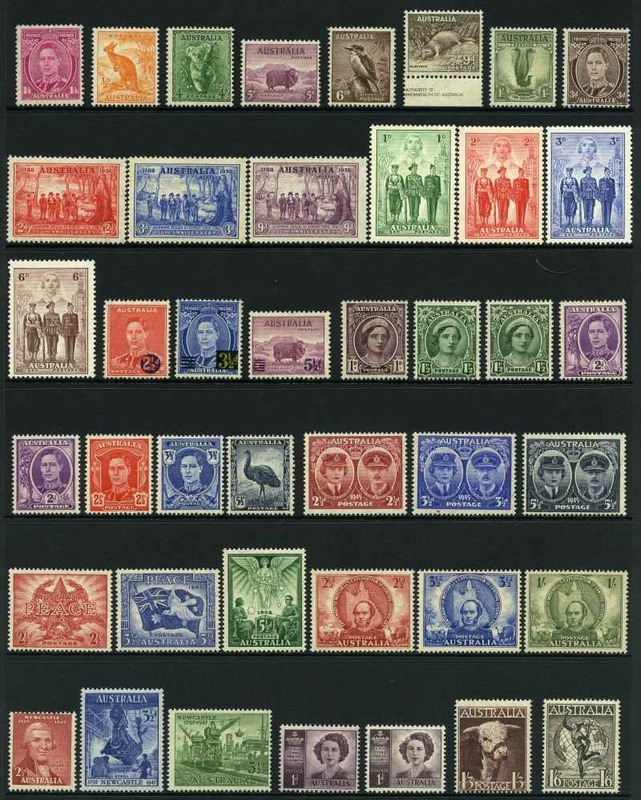 Collection of MUH and fine used Pre-Decimal and Decimal stamps from 1927 to 1986 including some FDC's and miscellaneous items, plus small range of Australian States, Kangaroo's, KGV, Postage Due and Foreign issues in 6 loose leaf albums, 3 Lighthouse stockbooks and shoebox. Noted 1963-64 Navigator set FU, 1971 Christmas White Paper folded blocks of 25 (2), some Australian Territories in part sheets, Aerogrammes, 1899 German Reichpost set of 6 O/P Marocco MUH and many other useful items. Varying duplication. Face value of MUH Decimal issues $427.00. Accumulation of 725 MUH Pre-Decimal from 1914 to 1965 in singles, pairs and blocks in VST stockbook. 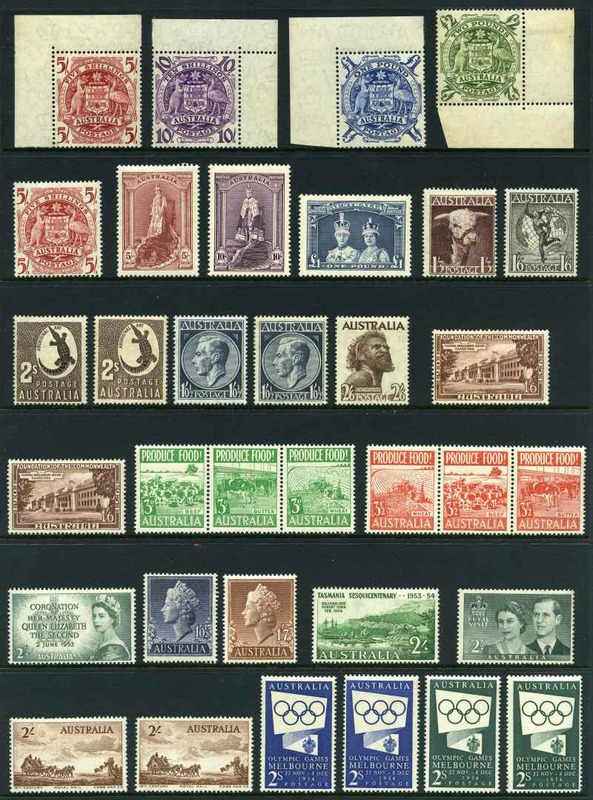 Includes 1914 6d Claret Kookaburra, 1927 1½d Canberra booklet, 1930 3d Sturt block of 6 and 28, 1931 3d Kingsford Smith Plate No 3 block of 25 with "Plane dropping mailbag" variety, 6d Kingsford Smith block of 10, 1932 6d Brown Kooka imprint strip of 4, 1934 3d Perf 11½ Vic Centenary (21), 1934 1/6 No Wmk Hermes, 1935 Anzac set, 1935 Silver Jubilee set, 1938 10/- and £1 Thick Paper Robe, 1949 10/- (4) and £1 (2) Arms, 1953 Food strip of 3 set (9), 1953-58 2/- Commemoratives (123), 1961 5/- Cream Paper Cattle (5), 1963-64 2/3 Commemoratives (47), 1964 10/-, £1 (3) and £2 Navigators, 1965 5d Red QEII booklet pane (4) and other handy items. Mixed centering and some minor faults. Very high retail value. Collection hundreds of MUH, MLH and FU Pre-Decimal and Decimal issues from 1956 to 1967, including 1963-64 Navigator set of 8 MLH, 1966 4¢ Red QEII booklet pane set of six slogans MUH, plus additional set FU, 1966 Navigator Specimen set MLH and many other useful items. Also small range of mostly used Australian States. 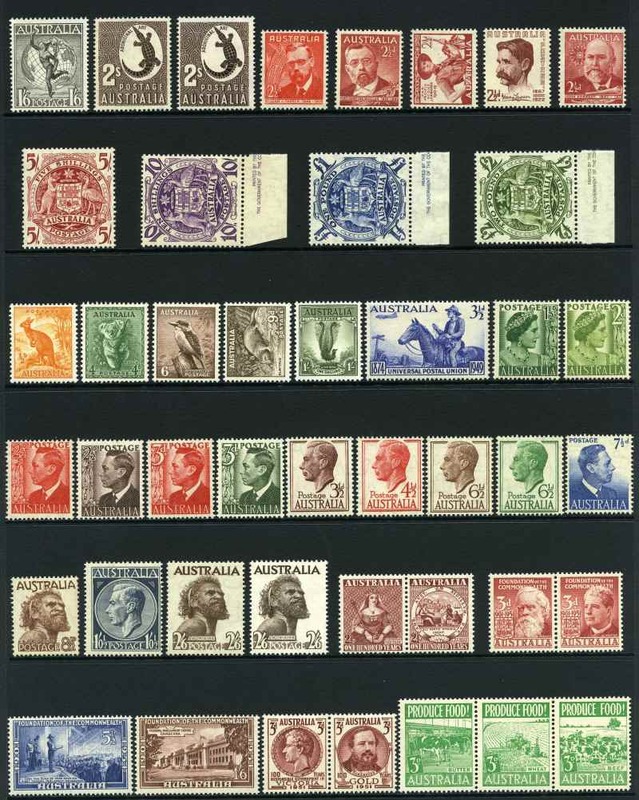 Collection of used Pre-Decimal and Decimal stamps from 1913 to 198,7 in sparcely filled Seven Seas Hingeless album in 2 binders, plus small accumulation in packets and range of Australian, Australian Territories, PNG and New Zealand FDC's in shoebox. 2013 60¢ Government Houses set (2,000 sets), 2013 60¢ Headline News set (1,000 sets), 2013 60¢ Historic Railway Stations set (2,000 sets) and 2014 70¢ Bush Ballads set (1,000 sets) Peel and Stick in bundles of 100 good to fine used. Accumulation of 24,100 good to fine used Peel and Stick stamps in bundles of 100, including 2012 60¢ Living Australia set (100), 2013 60¢ Surfing set (200), 2013 60¢ Top Dogs set (200), 2013 60¢ Legends of Music set (100), 2013 60¢ Botanical Gardens set (100), 2013 60¢ Government Houses set (1,100), 2013 60¢ Road Trip set (500), 2013 60¢ Indigenous Leaders set (600 sets), 2013 60¢ Headline News set (400), 2013 60¢ Historic Railway Stations set (600), 2014 60¢ Native Orchids set (100), 2014 60¢ Legends of Cooking set (100) and 2014 70¢ Bush Ballads set (300). 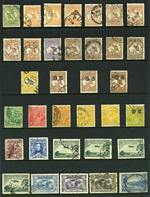 Also range of recent Decimal sheet stamps, sorted into various size bundles good to fine used. Accumulation of tens of thousands of used Pre-Decimal and Decimal stamps off paper in wine carton, predominately Decimal issues with some higher value commemorative content. Weight 5kg. Also Australian States accumulation in small box, plus hundreds of mostly lower value mint Pre-Decimal issues in packet. 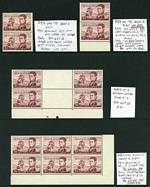 Accumulation of tens of thousands of used Decimal stamps off paper, from 1966 to modern in carton. Weight 9kg. Accumulation of many thousands of used Decimal stamps, off paper in shoebox. Mainly recent peel and stick issues with a good proportion of commemoratives, but does include some Pre-Decimal and earlier content. 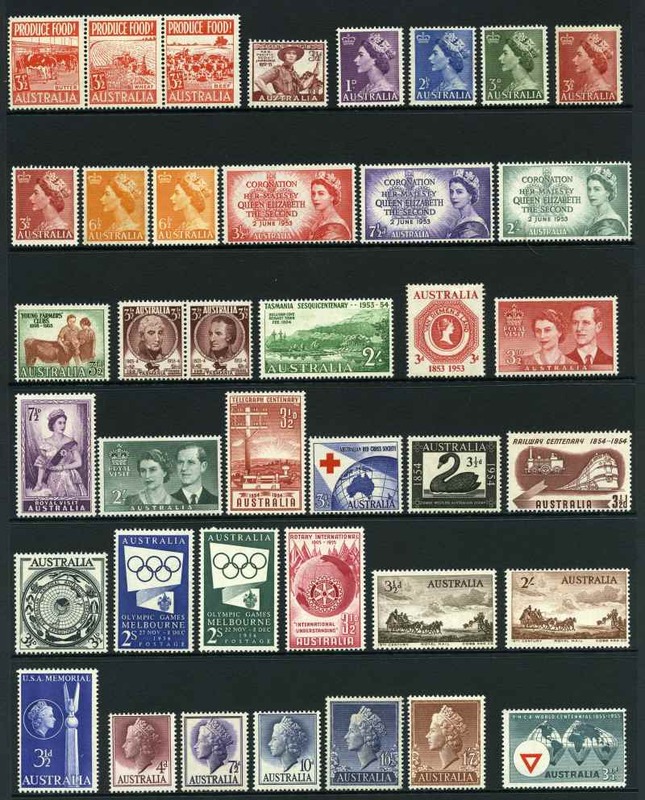 Selection of mostly MUH stamps on circuit sheets, with main strength in listed Decimal varieties. Priced to sell some years ago at $573.00. 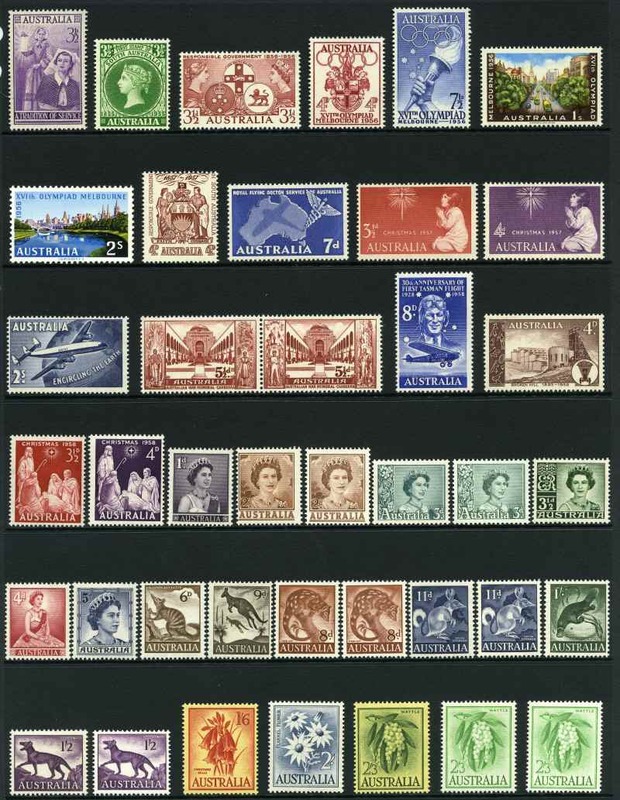 Selection of 1,525 different used stamps, with numerous sets including a few States, Australian Antarctic Territory, Christmas Island Australia and Cocos (Keeling) Islands Australia issues. Accumulation of thousands of mainly Decimal used stamps, plus on paper mixture, including some Foreign content in 2 shoeboxes. Also range of official unaddressed FDC's from 1972 to 1982 and several commercial covers. Collection of used Pre-Decimal and Decimal stamps from 1913 to 1985 including 1963-64 Navigator set FU in loose leaf album, plus off paper mixture in shoebox with a useful range of better issues and a bundle of FDC's and mint PSE's. Also on and off paper mixture and 5 small stamp albums with some Foreign content in 2 shoeboxes. 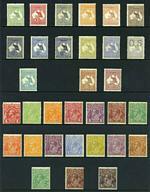 Collection of good to fine used Pre-Decimal and Decimal stamps from 1913 to 1974 on album pages. 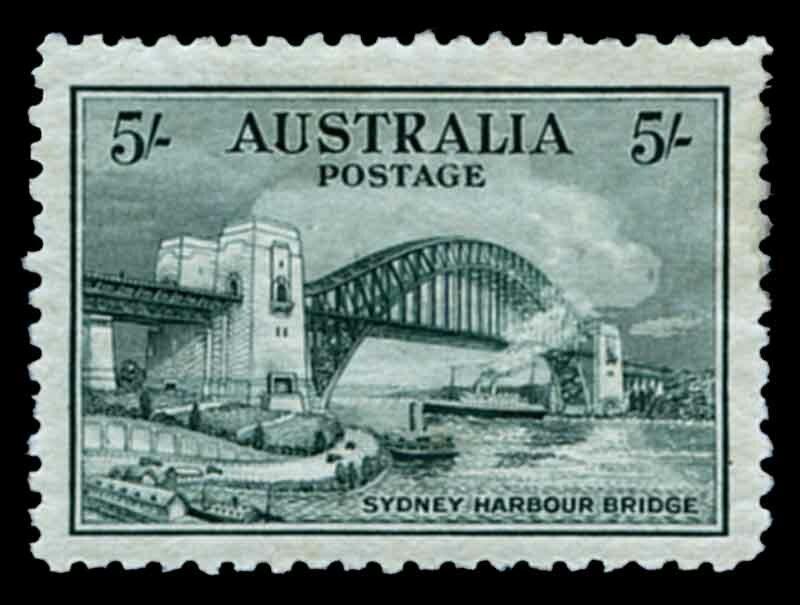 Noted a range of Kangaroo issues including 10/- 3rd and C of A Wmk, largely complete KGV issues, 1914 6d Claret Kookaburra, 1932 5/- Sydney Harbour Bridge (CTO), 1935 Silver Jubilee set, 1938 3d Blue Die I White Wattles KGVI, 1938 Thick Paper Robe set, 1949-50 Arms set, 1963-64 Navigator set and many other handy items. Odd minor fault. 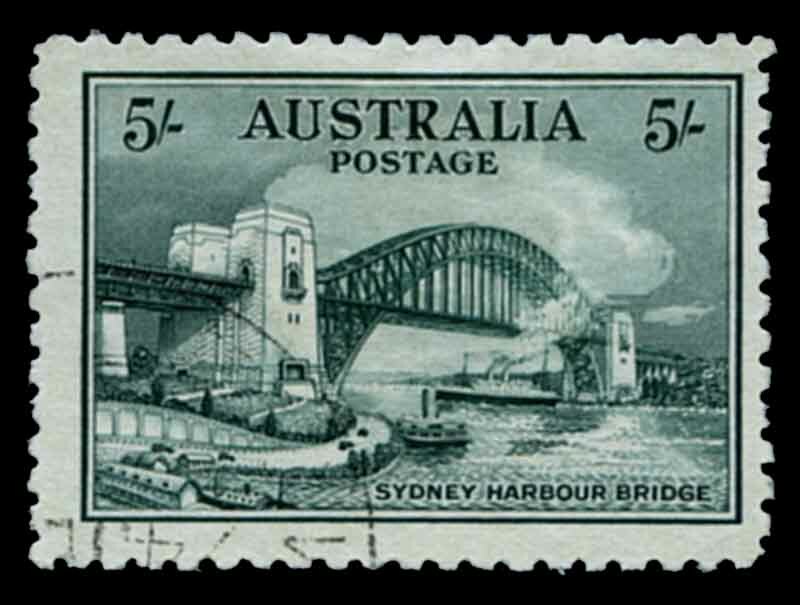 Collection of mostly used Pre-Decimal and Decimal stamps from 1913 to 1974 in Seven Seas Junior album and Hagner binder, including handy range of early issues and some Kangaroo and KGV stamps, plus bundle of souvenir covers and PSE's in shoebox. Also Australia and Foreign off paper mixture in shoebox and USA 1980 Commemorative year folder. 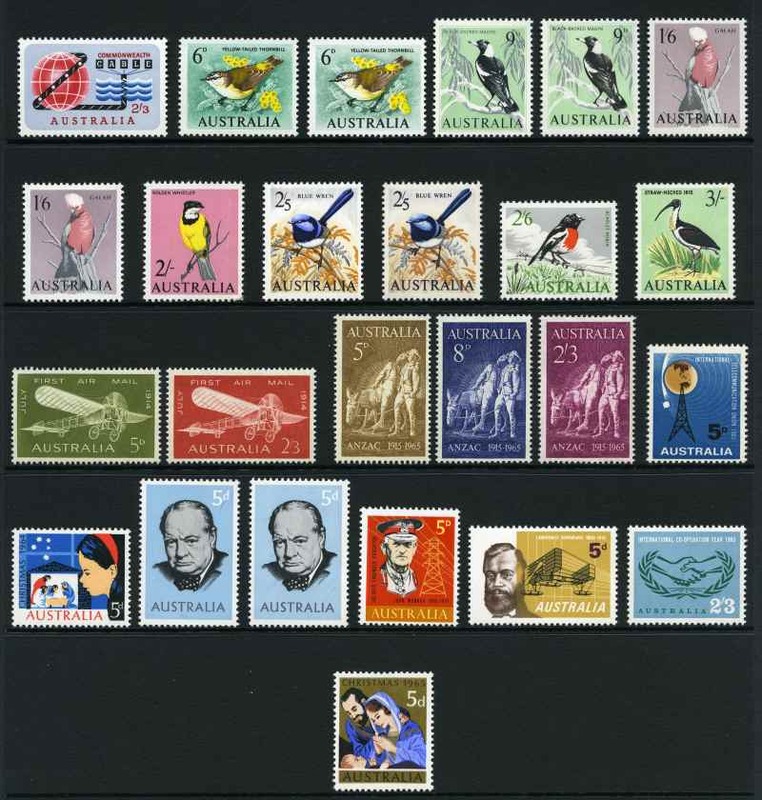 Collection of fine used Decimal issues from 1966 to 2002 including many sets, miniature sheets, booklets and Australian Antarctic Territory in 2 Hagner binders. All issues from 1976 Stamp Week onwards CTO with Adelaide or GPO Melbourne cancellation with gum. Some light duplication. Face Value of CTO issues $826.00. Accumulation of thousands of mostly used stamps in 5 albums or stockbooks, off paper in packet and on paper mixture in shoebox. Also shoebox of Australian official unaddressed FDC's and some PSE's. Accumulation of many thousands of used Pre-Decimal and Decimal stamps off paper from 1935 to 2007, sorted into envelopes and packets, plus off paper mixture in shoebox. Carton containing many thousands of used Pre-Decimal and Decimal stamps off paper from 1930's to 2003, sorted into packets. Predominately Decimal issues with a good proportion of commemoratives. Accumulation of many of thousands of used stamps off paper in carton. 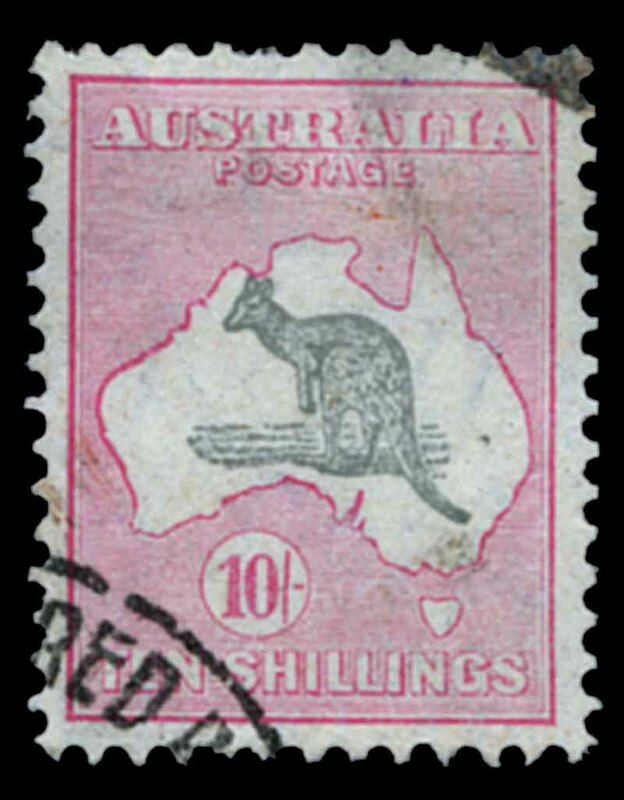 Predominately Decimal issues, but includes a proportion of Pre-Decimal stamps. Accumulation of thousands of used Decimal stamps off paper in shoebox, plus 5kg of on paper mixture. Mostly modern material, but includes some Pre-Decimal and earlier Decimal period. Accumulation of 5kg of Pre-Decimal and Decimal on paper mixture, plus Decimal off paper accumulation in shoebox and Decimal used collection from 1966 to 1986 in Seven Seas Hingeless album.